The new Becherovka campaign is unbelievably yummy. That is to say, it joined forces with the well-known foodblogging duo “Coolinári” being kind enough to prepare a series of recipes for the well-established liquor manufacturer. Becherovka rolled out its new campaign whose headline „Dnes piJeme s chuťou“(“Enjoy your fooDrink today”) follows in the concept of rejuvenating the brand joining traditional with modern. It embarked on a mission yet again to find passionate and enthusiastic people talented enough to come up with extraordinary things, just like Jan Becher himself did. He pulled out all the stops and put his nose to the grindstone to make his dream come true that resulted in the iconic Becherovka bottle. Passion to cook a meal with love is par for the course for the foodblogging duo Coolinári. They are ready to share this enthusiasm with all Becherovka fans. This time Becherovka goes back to its roots and original mission – it is no secret that it was once launched as a remedy for upset stomach. What else if not Becherovka springs to mind when speaking of natural aperitivo and beneficial digestive qualities which during the course of time obviously made the liqueur the best candidate as an inevitable part of family get-togethers and parties where needless to say, ample amount of delicious meals are present, too. Thanks to the latest recipes introduced by famous foodbloggers, Becherovka’s effort to accompany an excellent meal is trending these days more than ever. „These days people are eager to go ahead and put their inspiration to work experimenting with new recipes, on the other hand though, they do want to be loyal to the honest home-cooked meals. Becherovka has always managed to further highlight the taste of an excellent meal and thanks to its smooth spicy aroma, it perfectly complements even hearty meals more often preferred and enjoyed in this time of the year with the arrival of the fall/winter season. Coolinári have perfected a couple of gourmet recipes involving meat, definitely worth giving them a shot with a shot of Becherovka,” Zuzana Benková, Becherovka’s brand manager shed some light on the new concept. 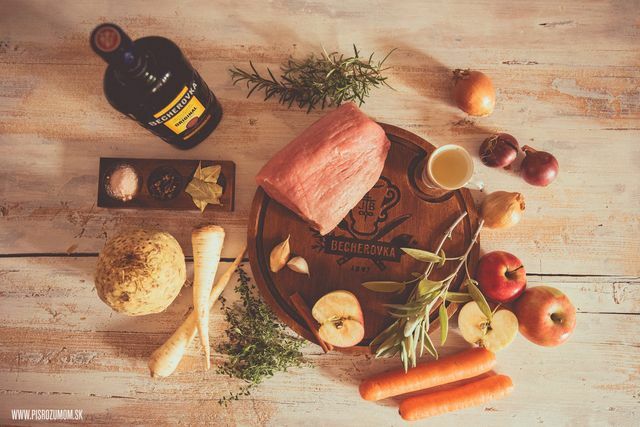 The Becherovka Facebook page offers a valuable insight on the ongoing online campaign where all fans may look forward to a plethora of exciting, new recipes, tips and suggestions how to make your own honest meals at home throwing in some quality meat, too. What’s the use of a good recipe if no meal is prepared, right? And that’s exactly where Miška and Kamil, the owners of the food blog Coolinári put their skills to good use, a blog that has been enjoying unabated popularity throughout the years. „The tastes and smells around us serve as an excellent inspiration while coming up with new recipes. This time we found inspiration in the spices used in Becherovka, definitely capable of adding that much needed extra flavor to any particular meat. The tasty icing on the cake after it comes in a snifter containing the spicy liquor, Becherovka,” the Coolinári duo clarified, whose passion for a well-prepared meal is no secret. Visitors of a few select modern pubs can definitely look forward to go ahead and give specialties with meat a try along with Becherovka served in authentic hand-made snifters on special serving trays. „Modern bars and restaurants are eager to get back to the roots and serve meals in the original style which we would very much like to complement with typical serving of Becherovka in snifters. Our hope for the campaign is to reinforce the natural connection between Becherovka and a plate of great meal right in the place where it is enjoyed the most. “Added Zuzana Benková. Select bars and restaurants will be supplied with further POS materials with perfect functionality along an appealing look. The new Becherovka ambassador will instruct the personnel at a product training and the businesses in question will accommodate a special offer as to building unique flagship Becherovka outlets. The campaign will get a strong online support where all the participating pubs and restaurants will be introduced on the Becherovka Facebook page. If you are interested, you definitely should not miss out on the chance to win a dinner with Becherovka, specifically in the following pubs and restaurants: ConeyHotDog, ROXOR BRGR&BEER, UNAS BISTRO in Bratislava, “Partizáni” in Trnava, Burger Boutique in Nitra and Džazero Restaurant on the Vinianske lake. The campaign called Becher´s Lokal Bistro joins the online with the offline world. The Triad Advertising Agency got it off the ground and the campaign is about to run by the end of the year. The PR Agency MCC PRofessionals provides a priceless support that makes sure that all Coolinári’s recipes are well-covered in the online and offline media.